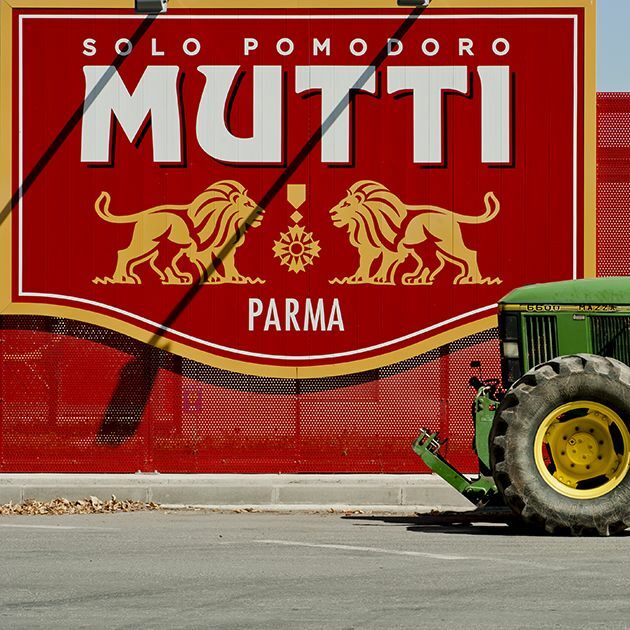 Mutti is a family business specialising in tomato conserves that was established 120 years ago and is located at the heart of Emilia-Romagna near that top gastronomic location, Parma. A selection of the best, 100% Italian-grown tomatoes, harvested in fields under the Italian sun and transformed just hours later to preserve their freshness and natural taste. Precise timing respects the flavour! To respect the fruit and its freshness, Mutti buys from growers located within a 100 km radius of its factory. The tomatoes travel just a few hours before arriving at their destination! They are peeled, seeded and sliced, chopped or centrifuged shortly after their arrival, with the utmost respect for their flavour and perfume. A wonderful story of a passion called "tomato"
In 1899 Marcellino Mutti, son of a farmer, chose to work with a fruit he loved: the tomato. His genuine passion was transmitted from generation to generation, with expertise, creativity and an unparalleled rigorousness. The business continues to grow. In 1911, Mutti reaped his first profit and received the Gold Medal for his double concentrate during the International Exhibition of Industry and Labour in Turin. Mutti was to receive many other prizes after 1914. Real pioneers, the Muttis have always been inventive in the art of transforming the tomato. 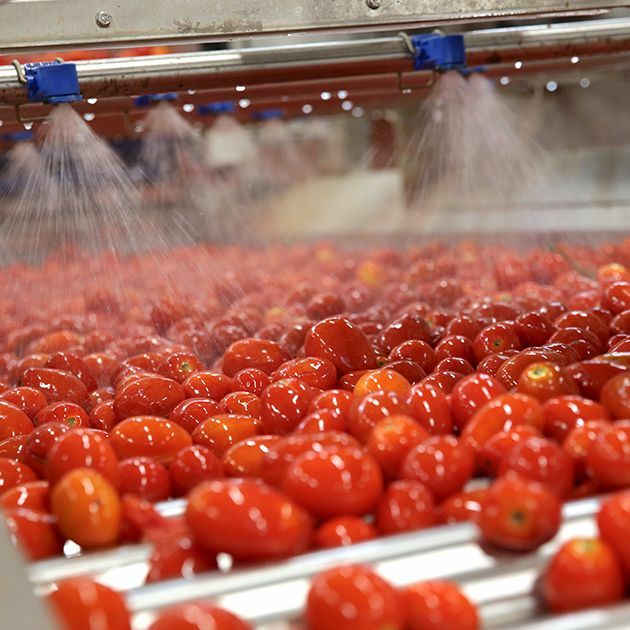 In 1951, they instigated a real revolution by inventing the tube of tomato concentrate, in 1971 they developed chopped tomato pulp, whose fabrication method remains a closely guarded secret. In 2004 they launched another great innovation in the world of the tomato: 100% tomato vinegar, an original product that reproduces all the intense flavours of the tomato. This was followed by sauces and a variety of flavoured concentrates, much to the delight of our taste buds! But for the Muttis, creativity must be intimately linked to quality. The collection of products brings the Italian sun to our plates! Traditional Italian dishes or simple daily Italian touches in the kitchen; the range of products on offer leaves you a free hand for any culinary fantasy - concentrates, pulps, purées, sauces, ketchup or tomato vinegar, the choice is yours! Tomato puree flavoured with Mutti basil is easy to cook! Simply re-heat. Try this tasty preparation, thick and rich with tomato and basil flavours. Ideal for your pasta or your white meat dishes. Tomato puree flavoured with Mutti vegetables is easy to cook! Simply re-heat. Try this tasty preparation, thick and rich with tomato and vegetable flavours. Ideal for your pasta or your white meat dishes. Mutti double tomato concentrate brings flavour and colour to your dishes. Idea for cooking with your pasta, your bolognese sauces and red meats. 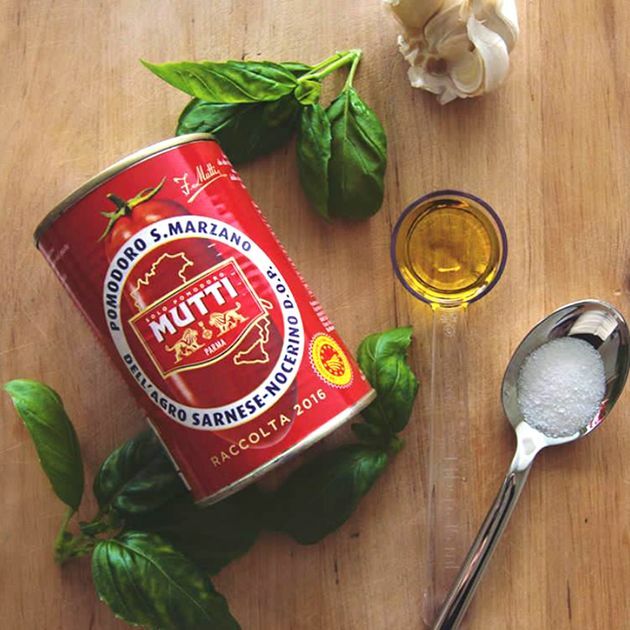 Try this Mutti pizza sauce, ideal for making your pizzas easy! This tomato sauce has a rather thick texture. With basil and oregano, it brings out all the flavours of Italy! Indulge! Mutti tomato vinegar comes from a simple, natural recipe: ripe tomatoes, for a unique flavour. Try this flavoursome vinegar, ideal for seasoning your salad and for marinading fish. Indulge! Mutti tomato purée, easy to cook! Simply re-heat. Try this tasty preparation, thick and rich with tomato flavours. Ideal for your pasta or your white meat dishes. Mutti tomato sauce with olives is made from tomato concentrate and tomato pulp. This sauce is tasty, simple and authentic. The taste of the olives heightens the flavour of your recipes. To try with your pasta dishes. Mutti tomato sauce with basil is made from tomato concentrate and tomato pulp. This sauce is tasty, simple and authentic. The basil brings a delicate, typically Italian flavour to your recipes. To try with your pasta dishes. The real thing. Yes, a ketchup made with Italian tomatoes. Perfect to enjoy as a sauce with pasta and potato dishes. Mutti tomato sauce with grilled vegetables is made from tomato concentrate and tomato pulp. This sauce is tasty, simple and authentic. Grilled vegetables delicately brighten your typical Italian recipes. Enjoy with your pasta dishes or white meats. Try this tasty tomato concentrate, it brings rich flavour and colour to your dishes. Ideal for your bolognese sauces, red meat dishes or even just on your pasta.